Vancouver, BC, April 6, 2010 – Canadian skier Lauren Woolstencroft had been known as the Golden Girl of Paralympics since 2002 when she claimed two gold medals and a bronze at the Games in Salt Lake City. At the Vancouver 2010 Paralympic Games her status evolved from impressive to legendary as she topped the podium in each of the five events she entered. Woolstencroft is the only winter Paralympian in history to win five gold medals at a single Paralympic Games. OMEGA, the Official Timekeeper of the Paralympic Winter Games, presented Woolstencroft with a Seamaster Planet Ocean wristwatch in celebration of her remarkable accomplishment. 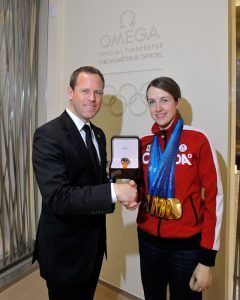 The presentation was made at the OMEGA Olympic Games Boutique on the ground floor of the Fairmont Hotel Vancouver. OMEGA’s famous logo has been a familiar site in Vancouver and Whistler and on television screens around the world throughout the Olympic and Paralympic Games. The brand’s association with the Olympic Games dates back to 1932 in Los Angeles and OMEGA was also proud to have the opportunity to apply its timekeeping expertise to the Paralympic Games. 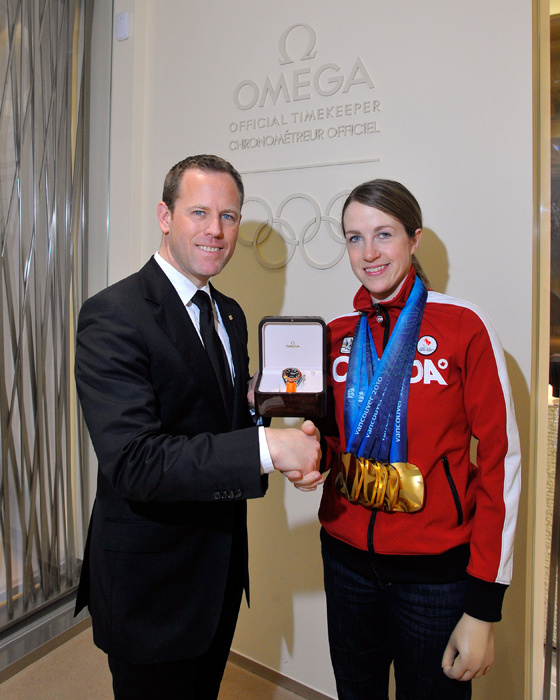 The 2010 Vancouver Olympic Games were the 24th at which OMEGA has been Official Timekeeper. The Swiss watchmaker recently extended its agreement to continue to serve in its timekeeping role at the Olympic and Paralympic Games through 2020.